Two persons were killed on the spot in a tragic road accident at Bokakhat in Assam’s Golaghat district on Friday morning. The accident took place near the factory of Methani Tea Estate. 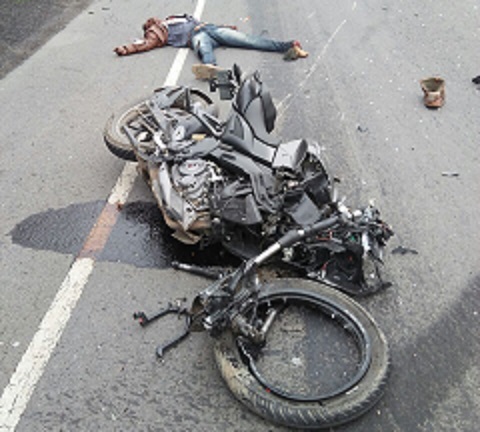 A goods laden truck bearing registration number AS 25C- 6393 mowed down a motorcycle bearing registration number AS 03W 1105 killing both the biker and the pillion rider on the spot. The deceased persons have been identified as one Kamakhya Mukhial and Anil Samchi hailing from Daria tea garden under Khumtai police station of the region. The identification was done from the voter ID card found in the pockets of the deceased. Meanwhile, police have begun investigation into the accident and is trying to trace down the good truck. On the other hand, a pall of gloom has descended in the entire region as this tragic road accident took place on the first day of Rongali Bihu, that is ‘goru bihu’ on Friday.